Urban Decay is one of those brands that I can't help but get jazzed about a new release whenever they come out with something different. 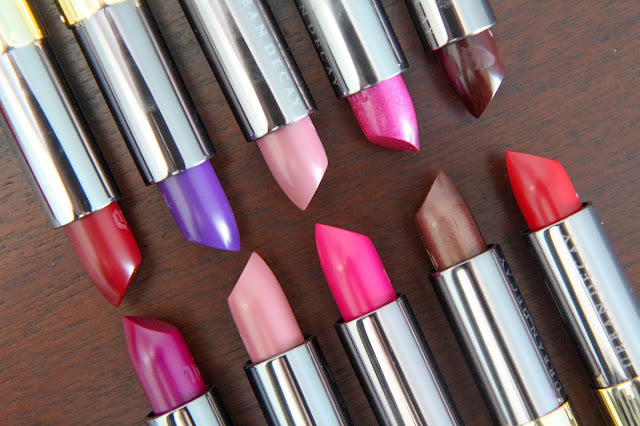 Their lipsticks and lip liners are some of my favorite around so when I got the opportunity to try out some products from their upcoming Vice Lipstick Collection, I nearly fainted with excitement. At $17 a piece they're definitely on the cheaper side of the high-end lipstick spectrum. There are a variety of different formulas (six to be exact) from comfort matte to metallic (which is seriously glittery). I must admit I enjoy the packaging of the Revolution lipsticks more than these, but the Vice lipsticks have just a standard lipstick tube and lid setup. I also noticed that I've seen a few of the shades before in other collections (like 714 is from the Gwen Stefani collab.) so it looks like Urban Decay is taking shades from other ranges to create one mega shade collection. It's a whole big lipstick rebrand and all your favorite shades will be getting a makeover to fit the new line. As for lip liners they're all just like the 24-Hour Glide-On pencils but with more shade options by the same names as the lipsticks. That way there's no confusion when you're looking for one to match. 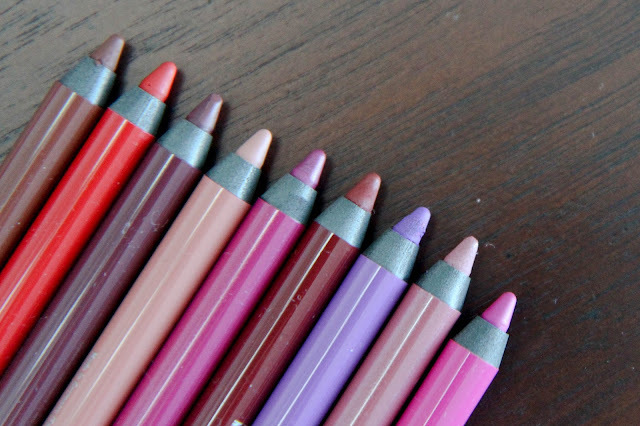 Nothing makes me more annoyed than trying to match a lip liner to a lipstick and failing miserably. The new collection launches June 5th and I think it's a seriously good move on Urban Decay's part. It makes perfect sense to release a huge collection of all the best shades and formulas all at once rather than a slow trickle in a bunch of different collections. There really seems to be something for everyone in the range and I'm sure it'll be met with a lot of good reviews when they go live. 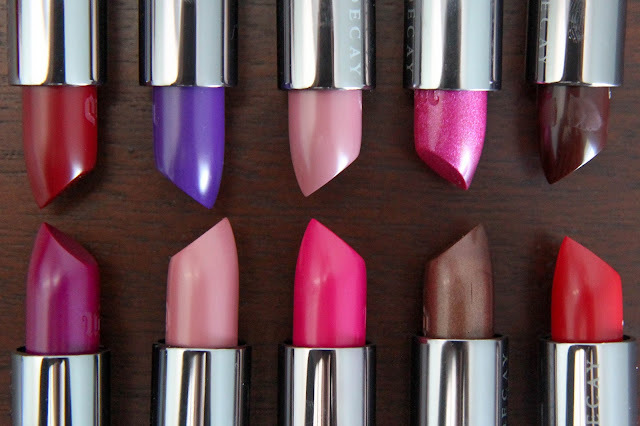 I'll definitely be talking about them more as I give shades a full test out, but for now I'm just going to stare at the pretty row of lipsticks and liners in satisfaction. What are you most excited about with the new collection?